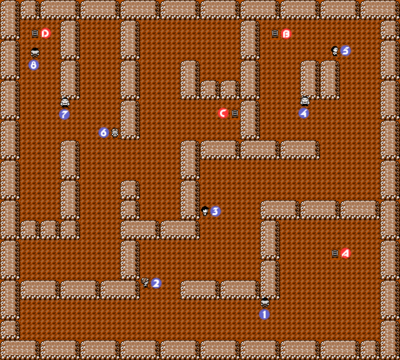 Rock Tunnel is the only way to get from Route 10 to Lavender Town. Unlike the caverns beneath Mt. Moon, Rock Tunnel is pitch black, and you must rely on the Flash technique (HM 05) to light your way. 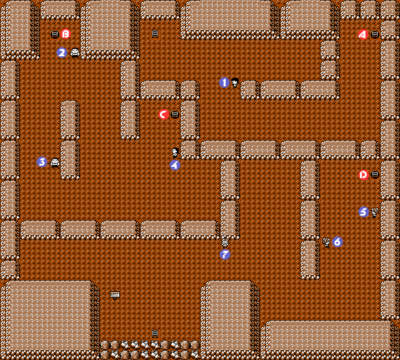 Use the labeled maps to follow the ladders through the tunnel to the exit. The tunnel has two levels, but there really is only one main path. The wild Pokémon in Rock Tunnel tend to attack more often than their above-ground cousins, and if you're being attacked every few steps, it may take you awhile to reach medical attention. For that reason, it's a good idea to bring either a Pokémon that knows Dig, or plenty of Escape Ropes just in case you need to make a quick getaway. If you don't have either of those, this would be a good time to try Repels, which keeps weak wild Pokémon at bay. However, Pokémon who are stronger in levels than your lead Pokémon can still ambush you. If your starter Pokémon was Bulbasaur or Squirtle you'll have a very easy time against the Rock and Ground-type Pokémon that lurks here. There are also some trainers with Water-type Pokémon so Electric-type Pokémon does good against them. Bring a few Ethers/Elixirs, Potions, and maybe a Revive or two to make sure you can get through in one trip. The cave is very dark and your screen will turn almost black so you won't see anything except for the walls that are bluish. The trainers aren't too tough here but you can accidentally run into them if you're not careful. You'll have to use Flash (HM05) if you want to see where you're going in here. It's possible to proceed without it, but if you do, hope you recognize where everything is. If you want to avoid a battle, walk a path that's far away from the trainer or that's out of the trainer's line of sight. They're not a common sight in any version, but anyone can track down and capture a Machop with a bit of effort. Machops are strong in Attack and HP and only get stronger as they evolve: into Machoke at level 28, and then into Machamp once they're traded, making it a good Pokémon for physical sweeping. They however have a rather poor Defense, Speed, and Special, making them easy targets for Psychic-type Pokémon, and the only considered powerful STAB move they have is Submission. Hitmonlee is probably a better option, especially if you can't trade, but Machop is available earlier and can still pack a punch. Rhydon and Golem are better choices for a Rock and Ground-type but Onix is still a decent Pokémon to have. It has a massive Defense and a mediocre Speed, but bad HP, Attack, and Special, making it rather susceptible to Water and Grass attacks. It suffers from a lack of good move choices, and it may be not so good at hitting hard, but it takes physical hits well. Note, however, that due to its strength, capturing an Onix with a regular Poké Ball is fairly difficult, even with low HP. If you have trouble capturing Onix, you might choose to return with stronger Poké Balls later on. Keep in mind, however, that despite its less impressive stature, Geodude's stats and movepool are superior. This page was last edited on 15 January 2017, at 20:59. This page has been accessed 1,338,213 times.